Recently, Green Monkey Records issued a rock collection entitled History of Northwest Rock Vol 1 1957-1968. Normally, this wouldn’t warrant much attention except for the participation of two of my favorite Seattle musicians, Jeff Kelly and Joe Ross, both of Green Pajamas fame. For those unaware of Green Pajamas, they are Seattle’s preeminent psych-rock band. If you’re a Seattle power pop fan (and older than 30 years old) then you’ve heard their work as back in the 90’s Material Issue had a minor hit with the Jeff Kelly penned “Kim the Waitress”. 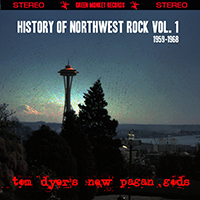 History of Northwest Rock Vol 1 is not your average tribute album or rock collection. Tom Dyer has assembled a band of fellow Seattle area musicians to perform some of their childhood favorites. This disc is a labor of love, not just another attempt to move product – and it shows in the results. Dyer has assembled some extremely talented local musicians including those mentioned above as well as Scott Vanderpool and Scott Sutherland of the King County Queens. Together, they call themselves Tom Dyers New Pagan Gods. Fifteen tracks in all, there are some recognizable favorites as well as some obscure pieces, all originally from Seattle area artists. You’ll recognize songs from Paul Revere and The Raiders (“Hungry”)and The Kingsmen (“Louie, Louie”). And the band’s cover of Merrilee Rush & The Turnabouts’ “Angel in the Morning” is a -pleasant surprise. But its some of the obscure nuggets that I really like such as the Franantics’ “Werewolf”, The Ventures’ “Walk, Don’t Run” or The Third Dimensions’ “She’s Boss”. This disc is a good listen for any fan of Northwest rock. You can buy the disc from Green Monkey Records. Mod Pop CD Review: Queen Annes Released!